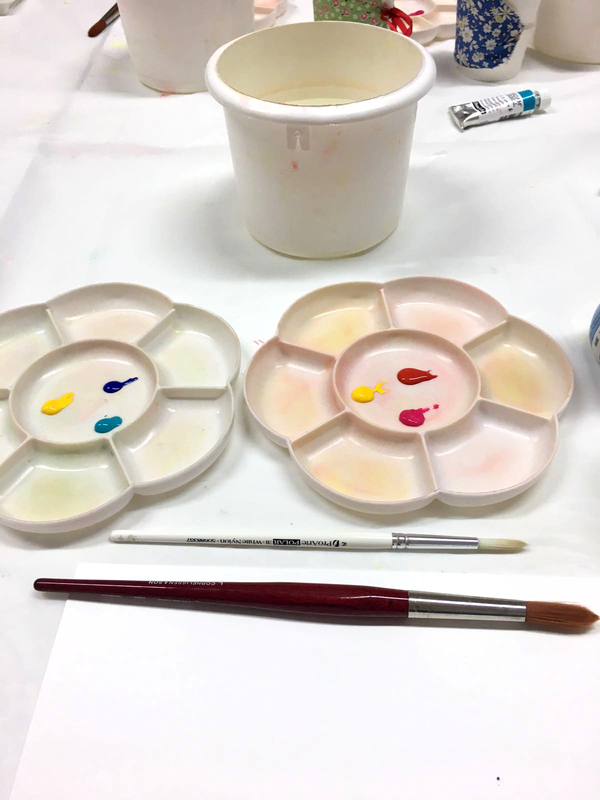 Round Brushes – as beginners, we were using two sizes – a number 6 and a number 10. 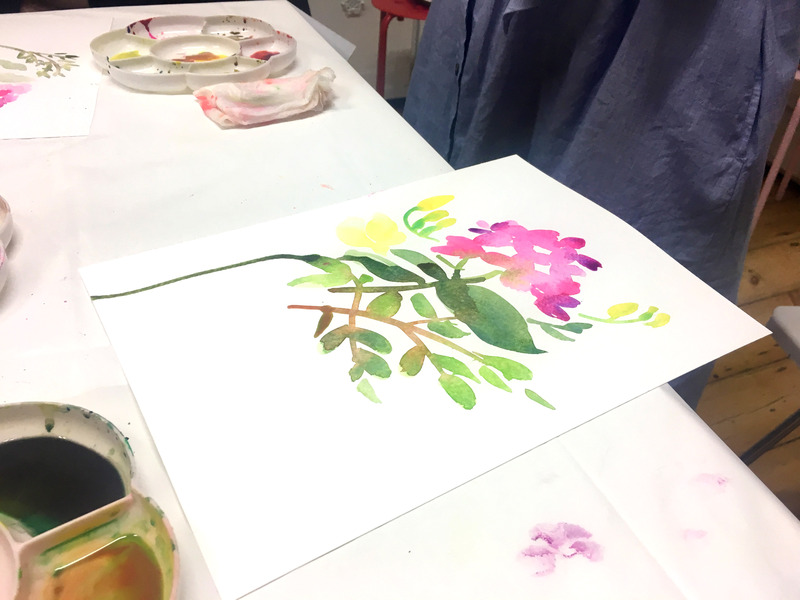 We started with the larger brush when we were experimenting, then moved onto the number 6 for finer work with the flowers later. 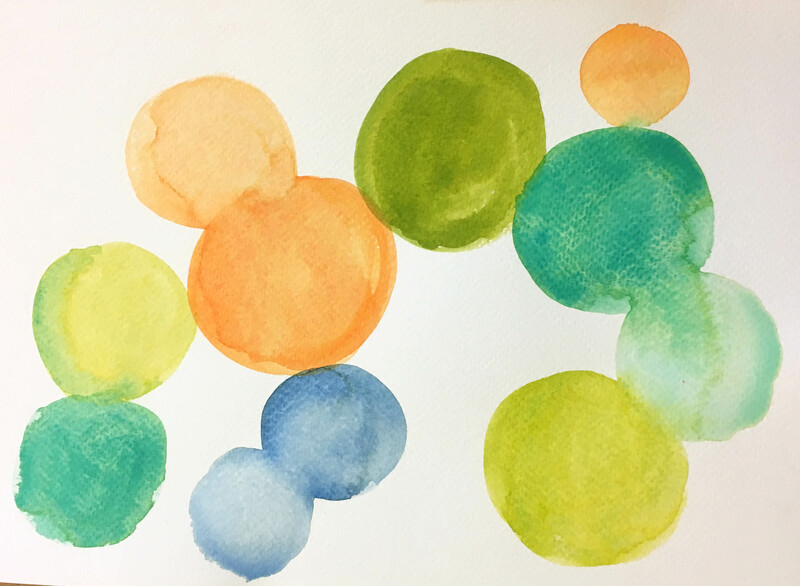 Watercolour paints – Michelle prefers using tubes of paint to palettes as it is easier to create more intense colours with tubes. 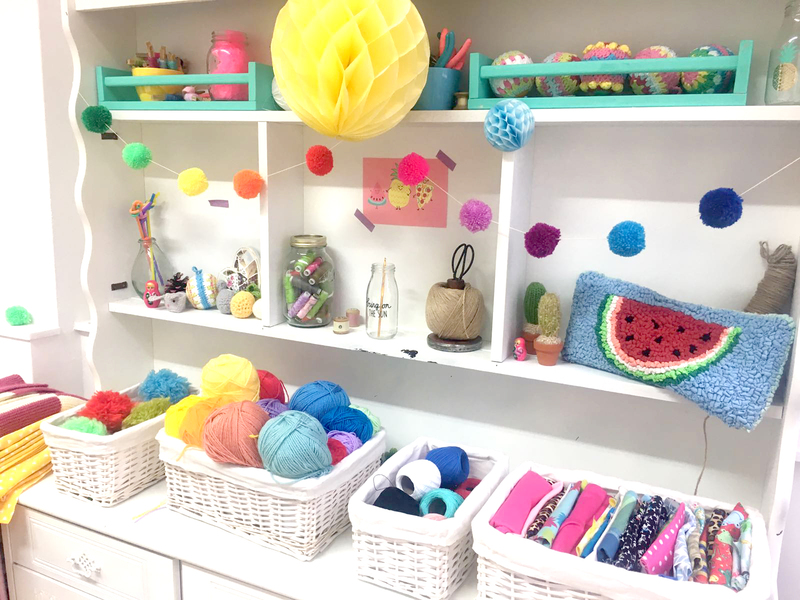 She gave us the very useful tip that it is relatively easy to make a whole load of different colours out of only the primary colours… blue, yellow and red, so there’s no need to buy a whole spectrum of tubes when you’re starting out. It’s also important to buy good quality paints as they give a better look and last longer than student paints. 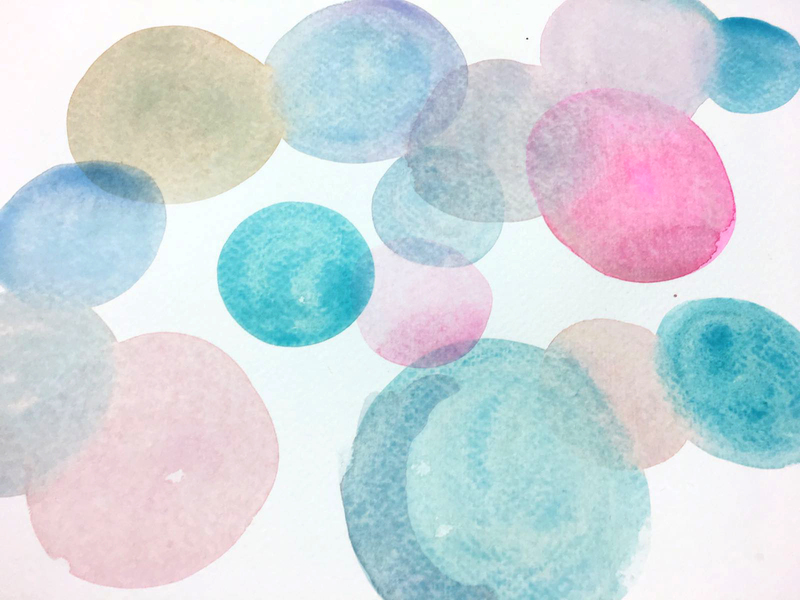 Paper – it’s important to use thick, good-quality paper for watercolouring as poorer quality papers have a tendency to buckle. 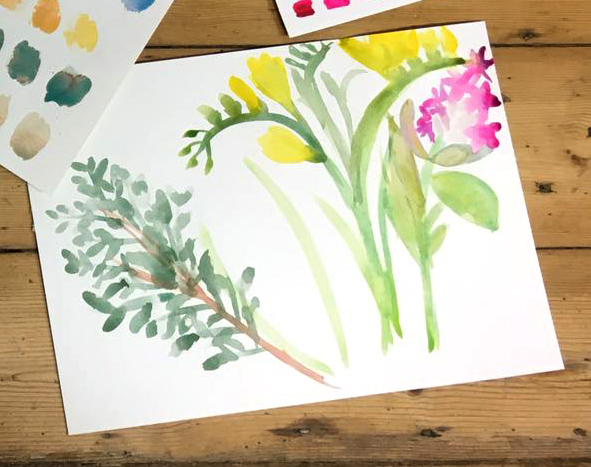 Most good craft shops sell specific watercolour paper. 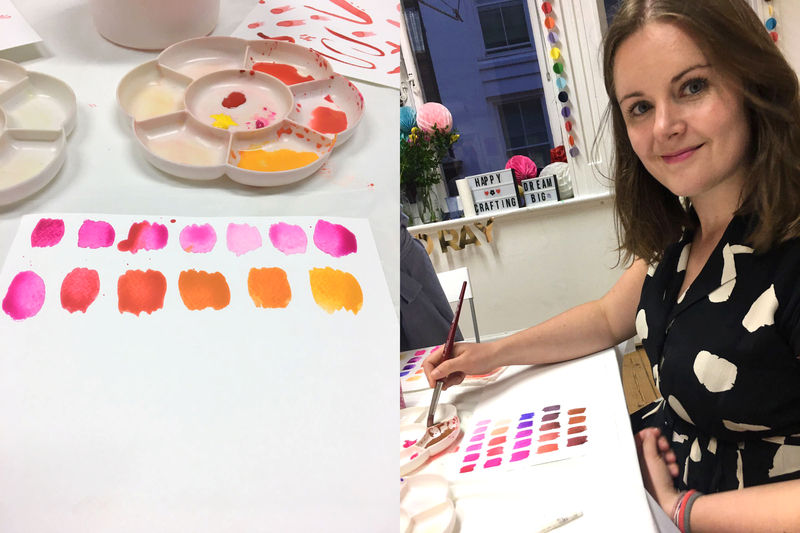 Daisy palettes – we had two each – one to mix our warm colours and one to mix our cool colours. 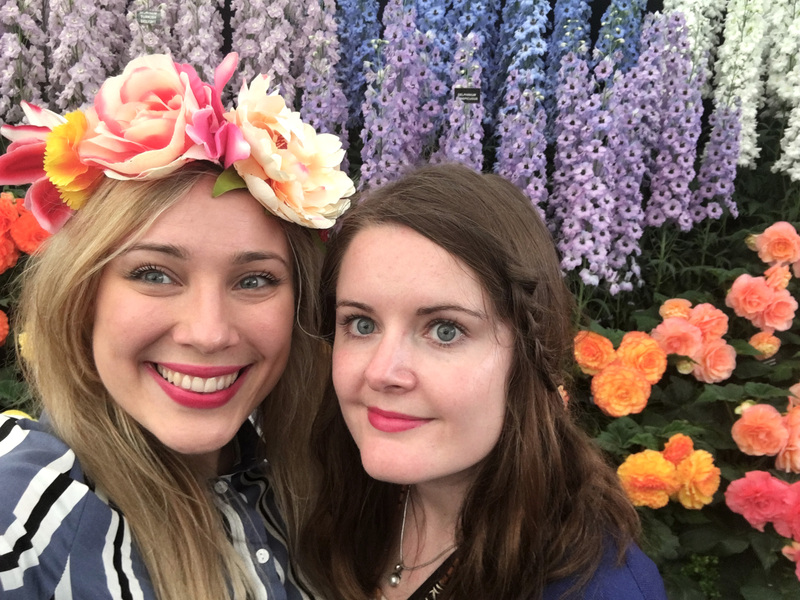 Pot of water – I had my water in a cute Kilner jar but any reasonably sized pot would work. 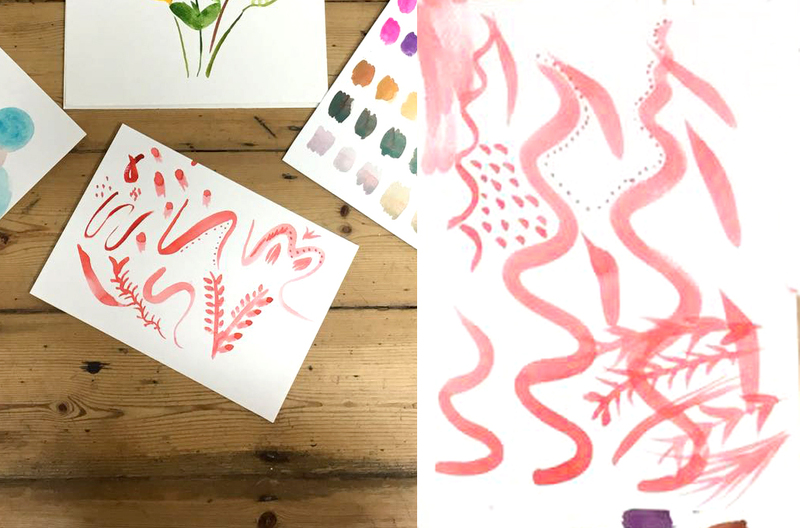 These were a few of the tools we had in our watercolour workshop… brushes, paper, palettes, water and paints. 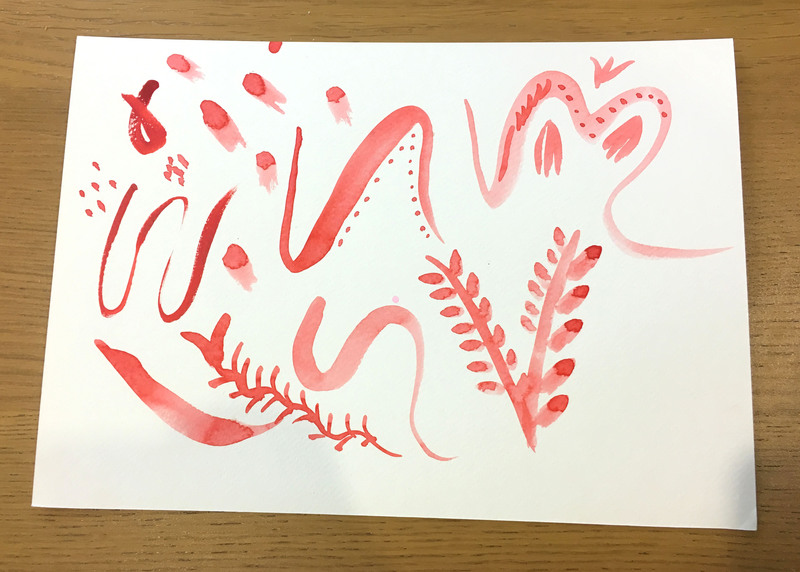 It was quite good fun just letting go and seeing what happened with the brush. 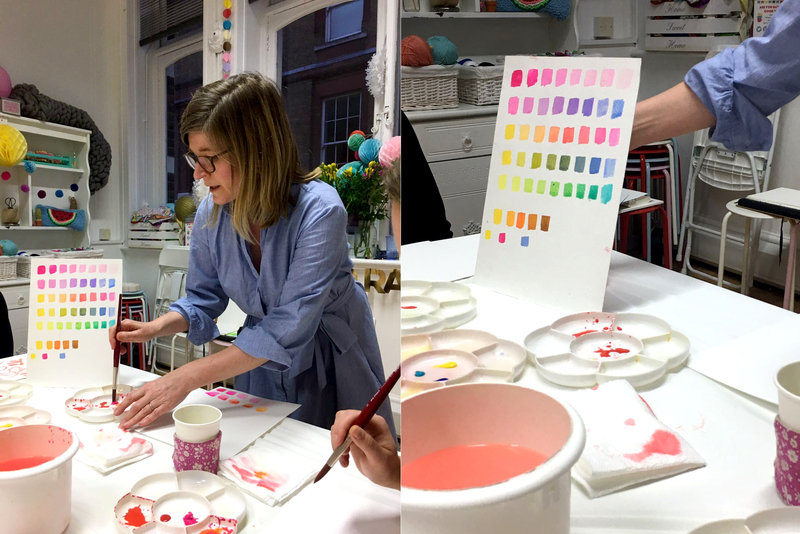 Here you can see mine and Kate’s colour charts being built up…. 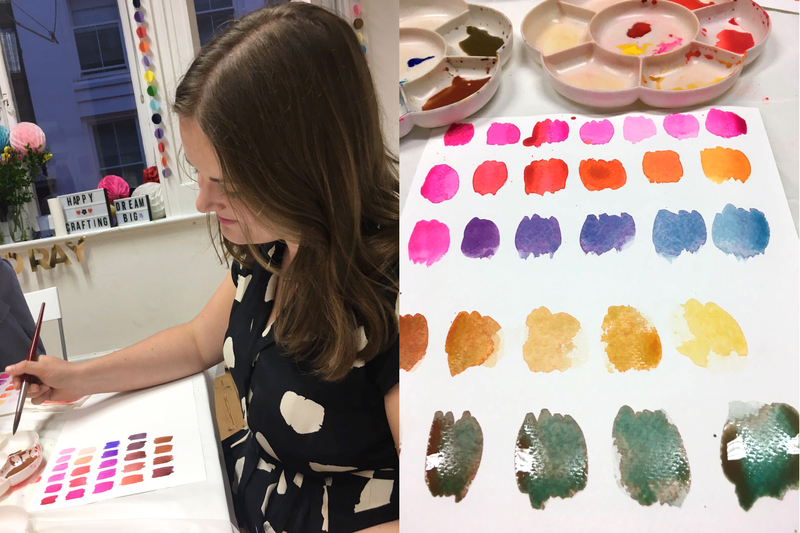 Kate managed to experiment her way all the way to green whereas I never made it past the browns and greys! 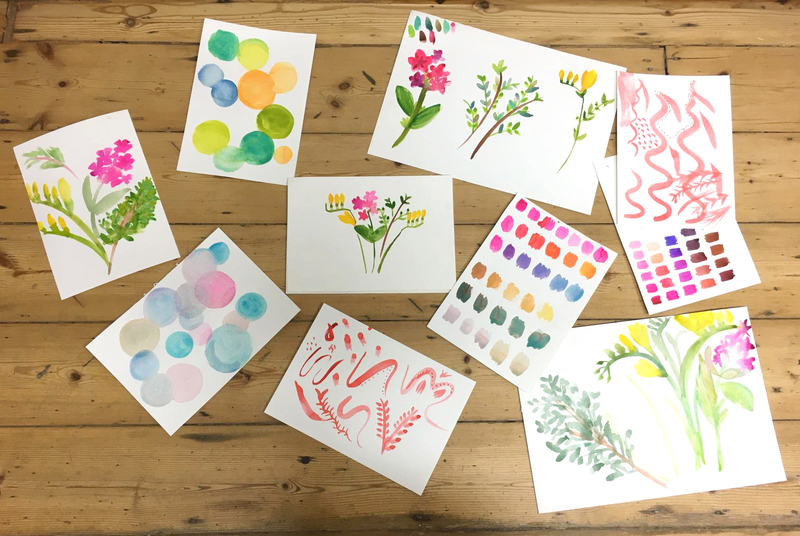 These were Kate’s watercolour circles. I particularly like the shading on the blue circle at the bottom. 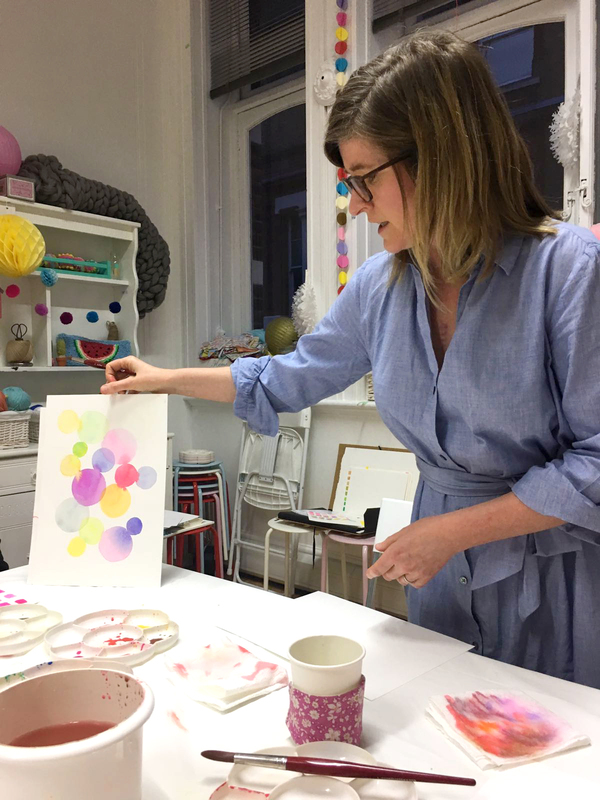 Our watercolour teacher Michelle showing us how to blend our circles together. My aforementioned colourful kitchen roll in the foreground! 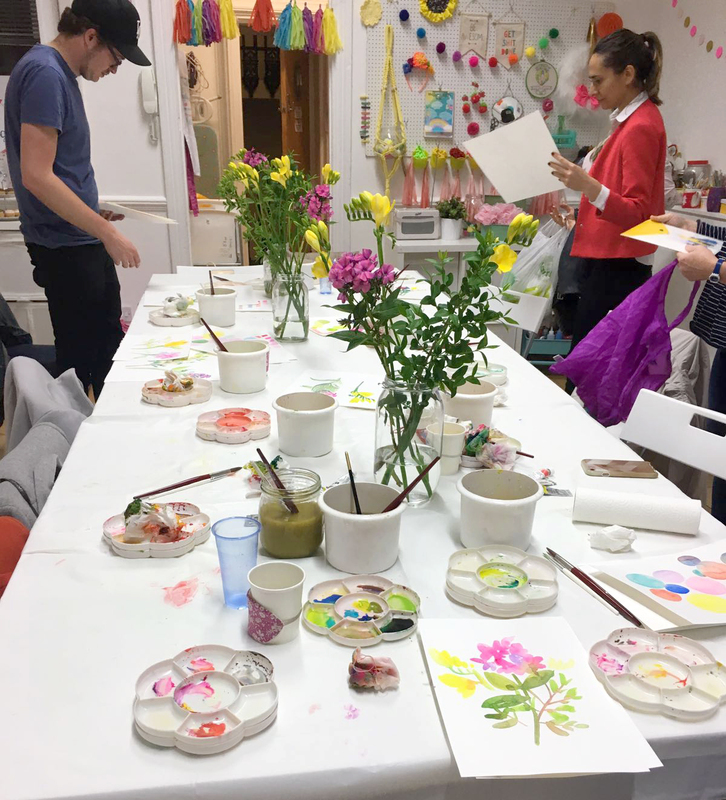 You can see the flowers we were asked to paint in the centre of the tables. 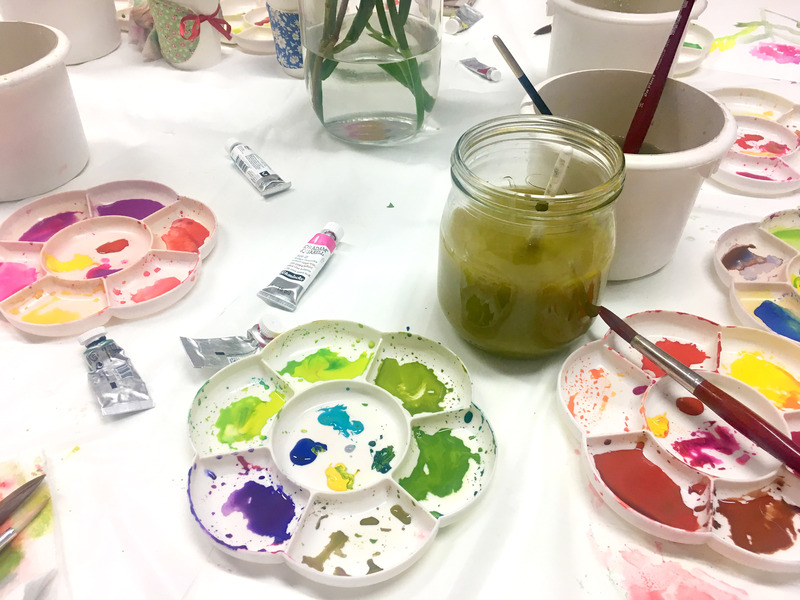 Kate and I were truly embracing the messy artist lifestyle… just look at that water! 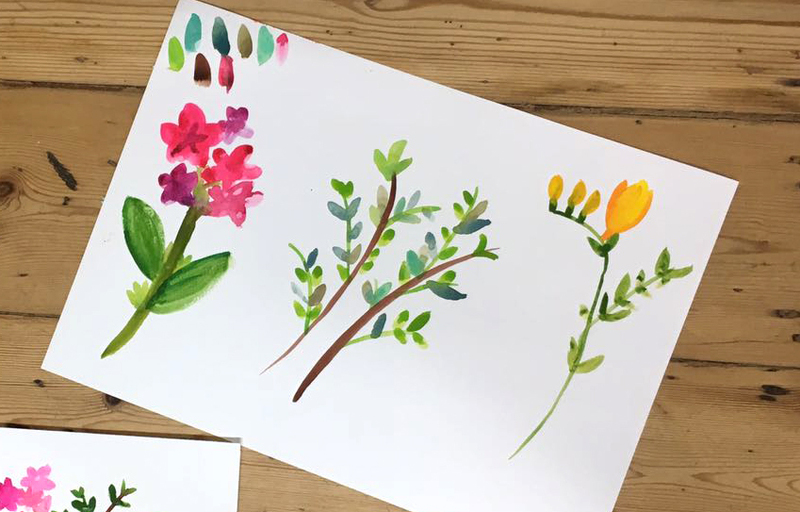 It took about 20-30 minutes for me to paint this little display of different watercolour flowers. 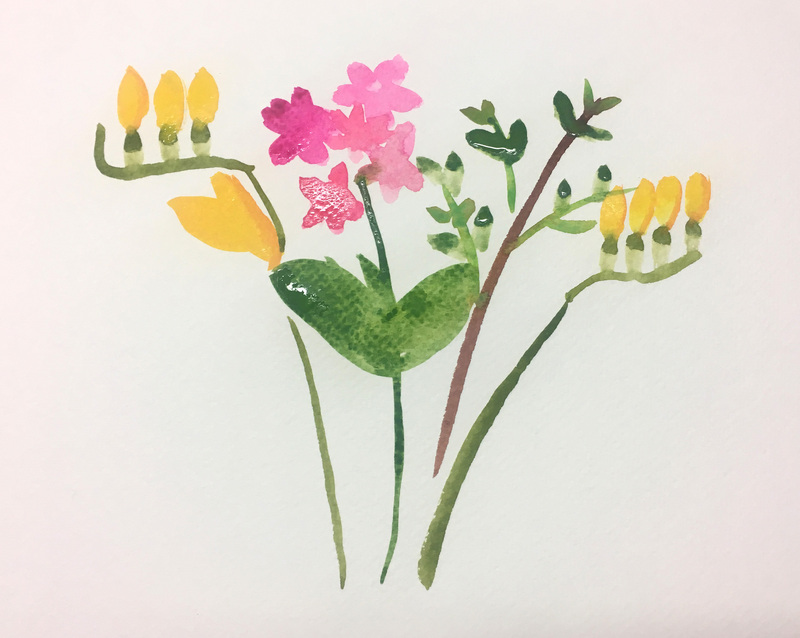 There are elements I liked about each of the different flowers and bits I wasn’t so sure about. 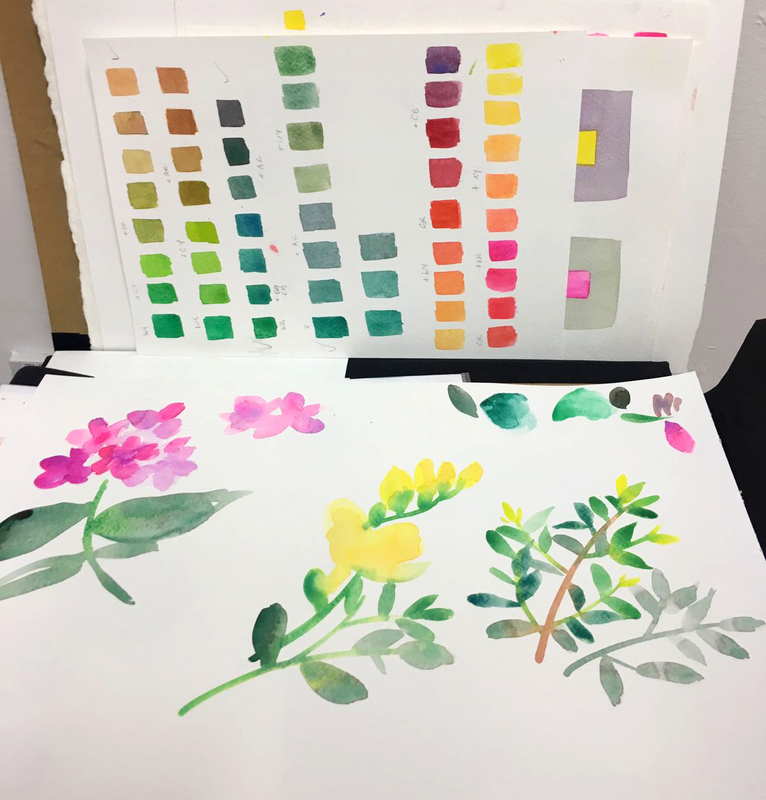 Even though we had the same exact subject and teaching, it’s amazing to see how different mine and Kate’s paintings looked. 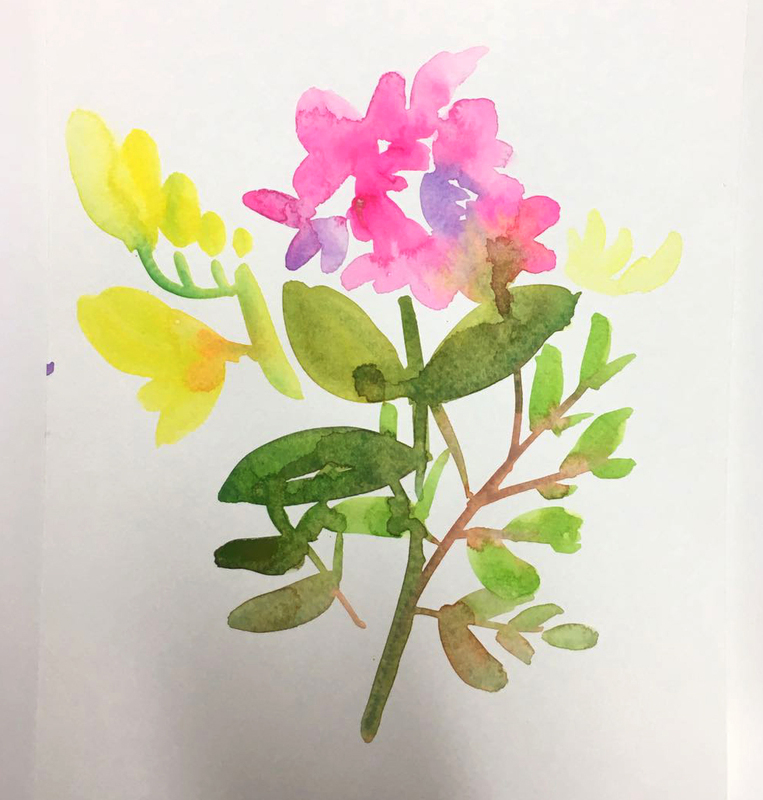 One of the other ladies on the watercolour workshop picked it up very quickly (she already did art in her spare time) and this is a clandestine photo of her flowers, which looked sooo good! 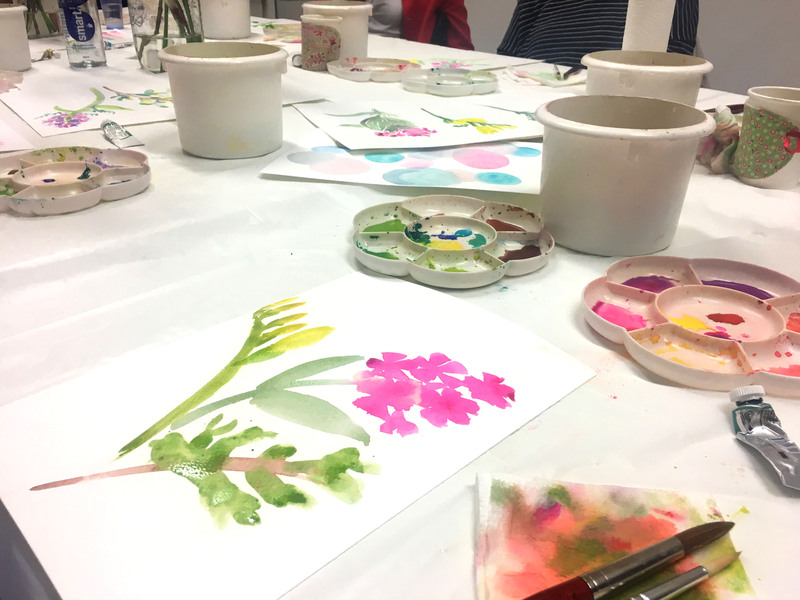 Ten minutes before the end of the watercolour workshop, Michelle gave us three minutes to sketch the same flowers that we’d been agonising over for half an hour. Her theory was that people overthink what they’re doing and sometimes get better results when they’re freer with the brush. 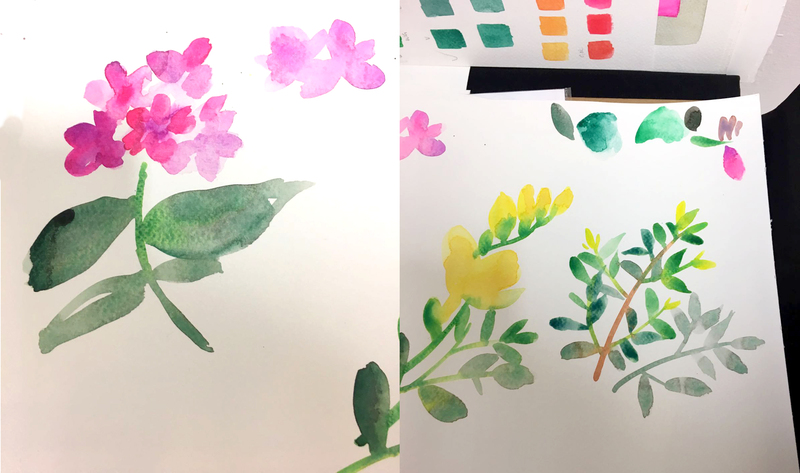 Well, I think she might be right because here is the flower compilation I did in three minutes, which I actually think looks a lot better than the one above, which took me nearly thirty minutes. What do you think? My watercolour masterpiece was still wet when this photo was taken. 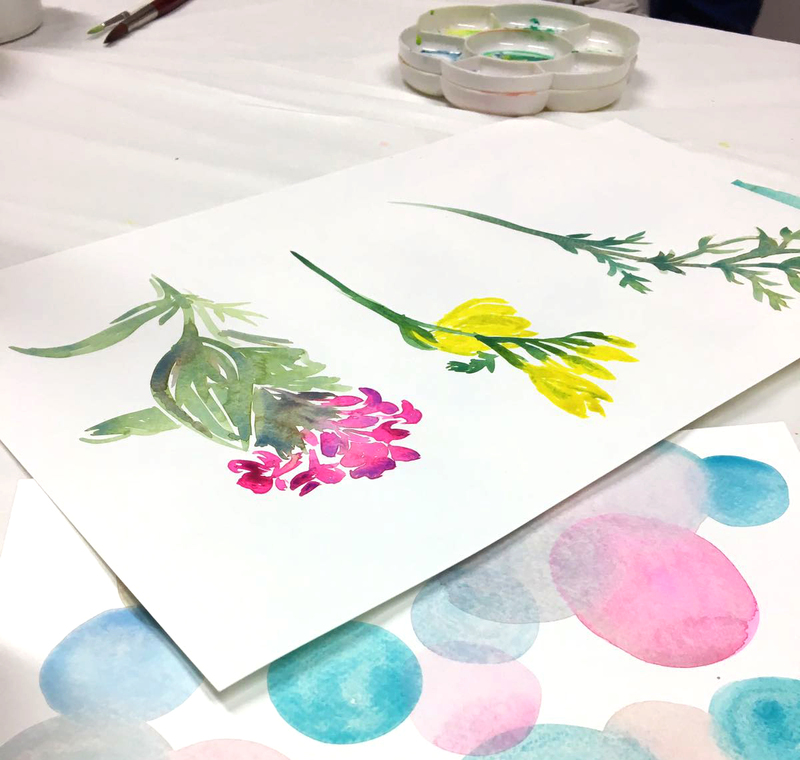 These were the flowers Michelle painted during the class. She’s an expert at creating depth and vibrancy. 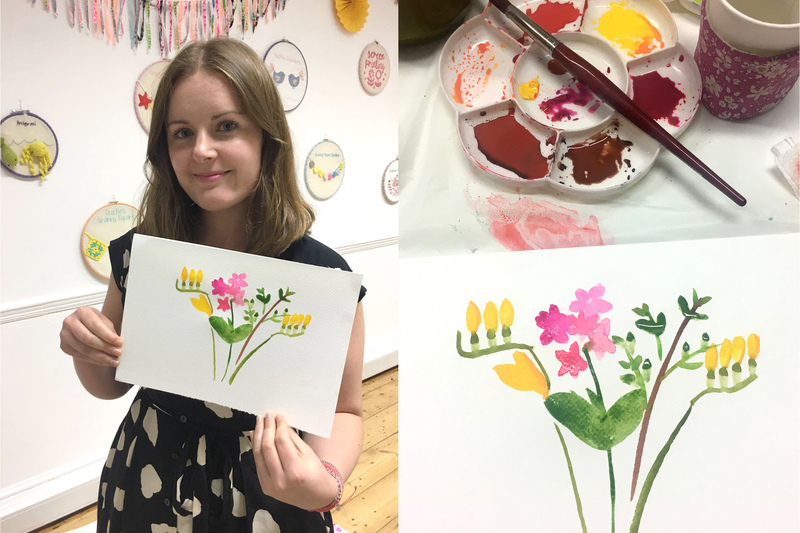 Gorgeous modern watercolour flowers by our watercolour teacher Michelle. 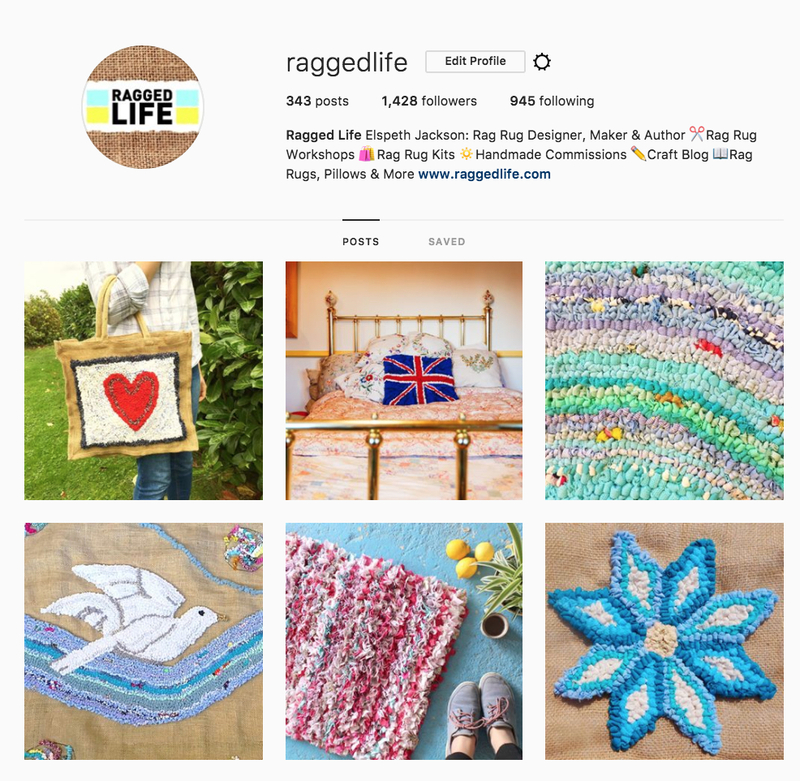 If you’d like to be the first to hear what fun shenanigans we’re up to, why not sign up for our Rag Rug Inspiration Newsletter here or join our Rag Rug Community on Facebook here for advice, resources and gorgeous rag rug photos. 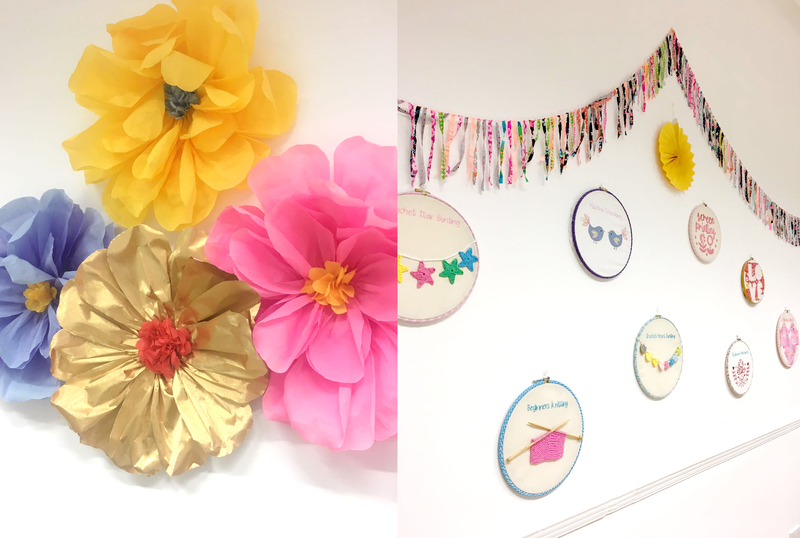 This entry was posted in Inspiration and tagged 2018, London, Other Crafts, Tea & Crafting. Bookmark the permalink.